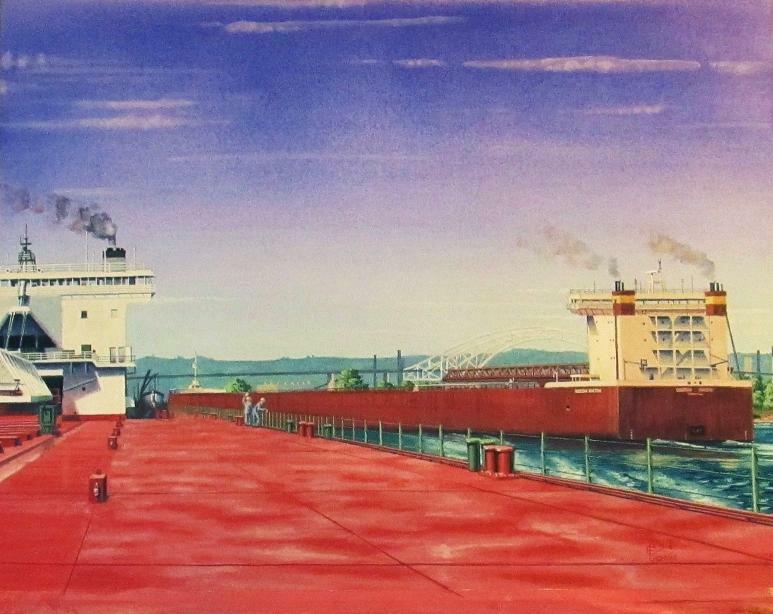 The downbound 1004 foot M/V Edwin H. Gott slides past the 1000 foot M/V Oglebay Norton in the Soo Locks on August 19, 2000. Both vessels are classified as footers , the term used by Great Lakes sailors to describe freighters 1000 feet long or longer. Loaded at Two Harbors, MN with over 66,000 tons of iron ore pellets and owned by U.S. Steel Great Lakes Fleet, the Gott has just locked down , passing downbound through the Locks at Sault Ste. Marie, MI on its run to U.S. Steel’s Gary Works steel plant in Gary, IN. The Norton, owned by Oglebay Norton Marine Transportation Co., has been waiting for the Gott to clear the Poe Lock and is now moving ahead to that same lock to lock up in its upbound run to Silver Bay, MN to load iron ore pellets. At times boats pass so close to one another, sometimes less than 100 feet, allowing crewmembers from one vessel to carry on conversations to reacquaint or catch up with relatives and friends on the other vessel.